Another very special memory was created on August 25th here at the Links. 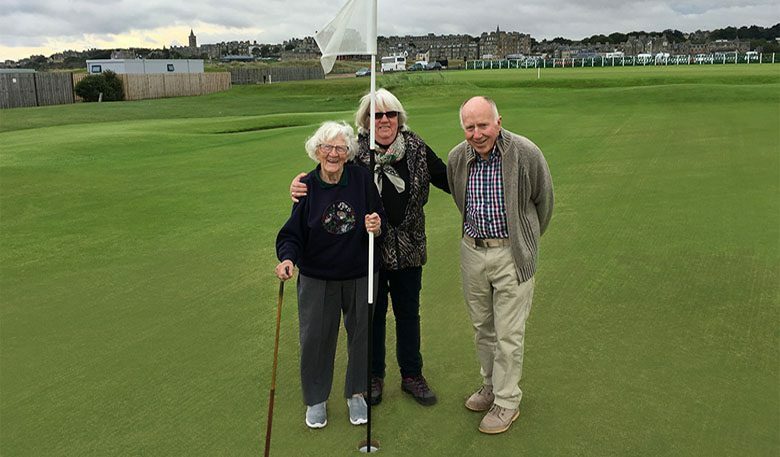 Returning after 25 years since her last round on the Jubilee Course, Magdalene Rowlands relived some of her cherished memories. 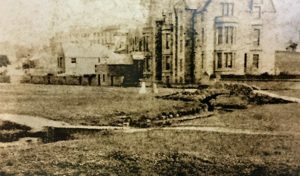 Having lived locally for many years, the Home of Golf was the setting for some of the fondest times in her life. 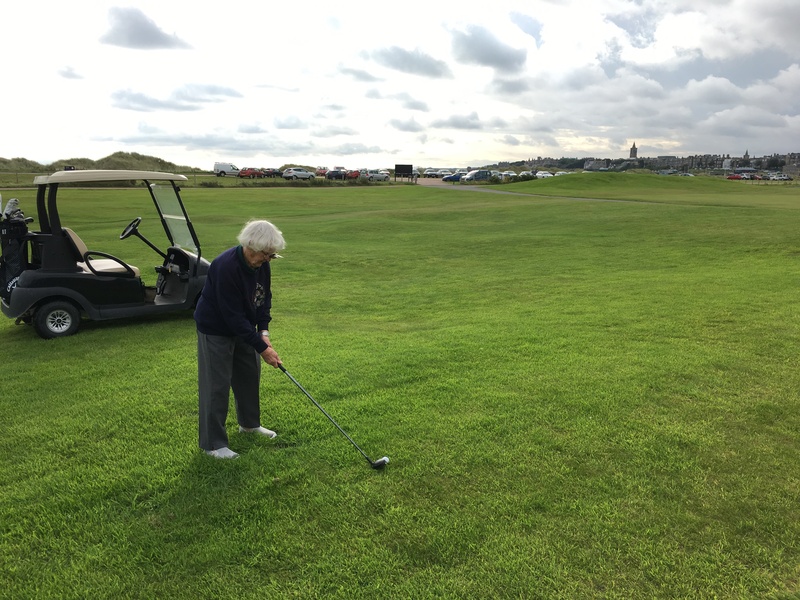 Magdalene played the 18th hole on the Jubilee Course at 9am. Buck and Magdalene’s daughter, Susan, were on hand to watch mum give that little white ball another wack at the grand old age of 100. Bunty could not have been more thrilled at the opportunity. Bunty you ask? As you might imagine, Magdalene’s led a colourful and full life. Affectionately known as ‘Bunty’ since she was knee high to a grasshopper, she recalls the local ploughman saying of her “Bunty pulls the strings” and it stuck! She was a mischievous youngster, full of energy and if she wanted to do something nothing would hold her back. This sprightly attitude still burns bright to this day. 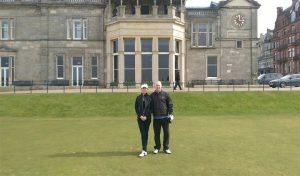 Buck and Susan arrived at the Links Clubhouse in good time with Bunty striding in leading the way. She explained she was nervous about playing again and wondered whether she’d be able. 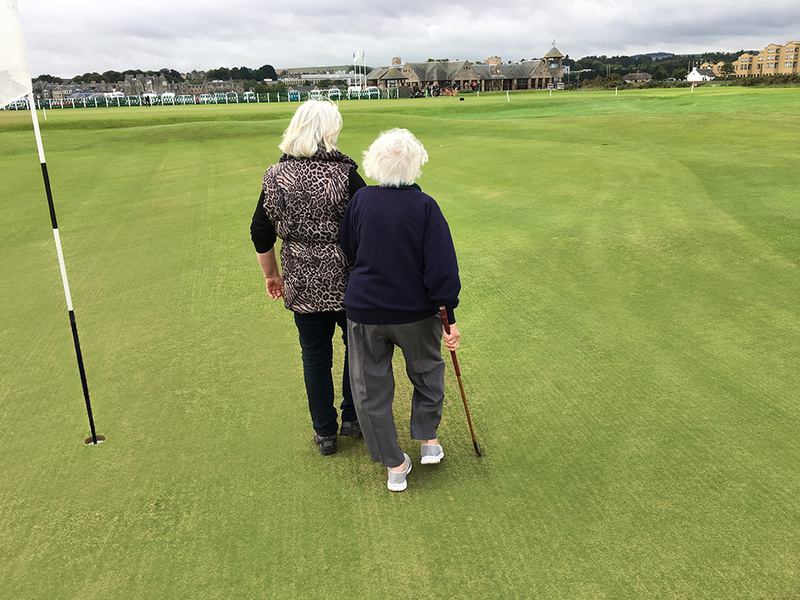 She practiced the night before swishing her walking stick and at first “struggled to get it right, but after a few swats the method came flooding back”. Bunty was full of stories and not all about glory days gone by – she keeps a keen eye on the modern game! When Justin Thomas’ ball hung on the edge of the hole at the 2017 USPGA Championship, she told us how she blew at the TV screen twice and with that not working she lept from her seat and blew for a third time. The ball defied gravity and dropped! 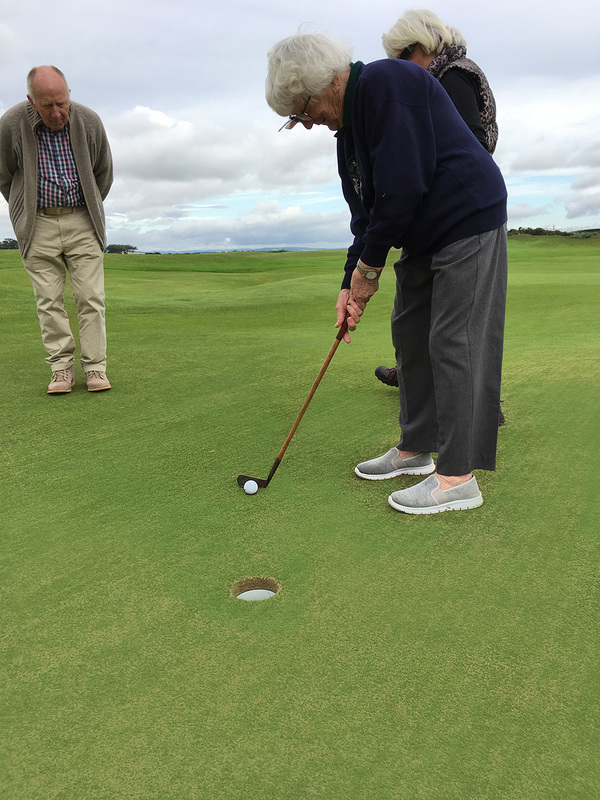 She was interested to find out more about the modern clubs we provided too. Having explained the hybrid to her she used it to sweep the ball off the fairway with good height and distance to match. Had no one been looking, our rental set would no doubt have one club less! After landing the ball to a little over 40ft on the green in five shots, Bunty rolled it up to within tap-in distance using her aunt’s old hickory putter and finished with an impressive seven. A result many younger and more able players would no doubt have taken on occasion. It was clear Bunty played the game purely for enjoyment and wouldn’t wrap herself up in pursuing perfection. The feeling of hitting the ball and watching it soar was good enough for her. With this mindset, as ability wanes over the years the enjoyment doesn’t. Bunty truly is an inspiration at 100.